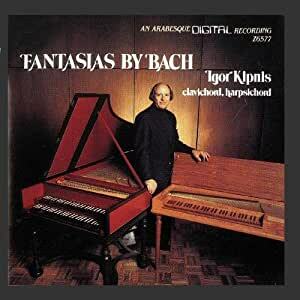 Igor Kipnis' 1987 Arabesque album of the complete Fantasias of Bach is a kind of 2 in 1 cd. The first 46 minutes of the 66 minute disc features Kipnis playing 6 Fantasies & Fugues on harpsichord. The last 20 minutes feature 3 Fantasias (including a reprise of the Chromatic Fantasy), and 1 Fughetta, played on clavichord. The clavichord is something I've been wondering about for a while, but the unversally tepid reviews I've seen of the handful of recordings in existence put me off. Now I finally know! The instrument is extremely soft sounding, and recorded here in realistic relation to the sound of the harpsichord. A little bit goes a long way. Both instruments are well played and recorded.